Enhanced Polyphonic Sample Synthesizer (E.P.S.S.) is quite excellent. It is a sample synthesizer with 4-8 polyphonic channels. It hooks itself into Cubase and you can compose the song there and have the audio output from the STe/TT/Falcon rather than via external soundmodules. The replays are well optimized and sounds very good. 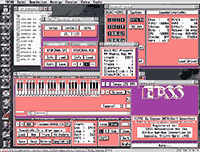 The work is saved in Cubase as a normal MIDI file and can then be replayed in Cubase or directly in the EPSS control.